Now that the NBA Draft is complete and the few amount of trades that happened are official, I wanted to do something different than the traditional draft grades post. I looked at the grades each team got on ESPN (Insider) and wanted to put together my thoughts on what took place so far this offseason. Below is a short list of things I liked and didn’t like. I tried to not only judge what teams did at the draft, but also trades that have happened so far this offseason as many teams will enter free agency this week with many question marks on their roster. The Blazers have been busy this offseason and are probably expecting more change to happen once free agency starts. Here is an overall summary of what they have done so far: they traded away Nicolas Batum, and the player taken with their first round pick in the draft Rondae-Hollis Jefferson. The Blazers have acquired Noah Vonleh and Gerald Henderson from the Hornets, Mason Plumlee from the Nets as well as second round pick Pat Connaughton. Even though on the surface it appears the Blazers simply traded away their first round pick this year for other young players, they acquired Noah Vonleh in an earlier trade who is acting as their first round pick. Vonleh was taken ninth overall last year and is only 19 years old. The Blazers also moved Batum to the Hornets who struggled last year and actually got some good value back for him. Batum is in the last year of his current contract and it was a smart move to trade him this summer. The reason I like the Blazers moves so far is because this is one of the many teams in limbo this offseason. With players like LaMarcus Aldridge, Robin Lopez and Wesley Matthews all potentially choosing to play somewhere else next season this team is currently caught between rebuilding around Damian Lillard and still trying to contend. Making moves like the ones they made puts them in a very good spot. The Blazers can still be competitive if all or most of those players decide to come back. Portland also found a way to maximize its trade pieces to quicken the rebuild if it comes to that. The Rockets made it to the Western Conference Finals this past season and still found themselves picking in the top 20 thanks to the Omir Asik trade. I thought for sure the best way to use that pick would be to select a point guard. That was clearly the team’s biggest need coming into the offseason, not to mention their current starting point guard is a restricted free agent. The Rockets decided not to pass up on forward Sam Dekker who fell farther than I thought he would. I was surprised Boston passed up on Dekker at No. 16 and I like Houston taking the best player left instead of drafting on need. Tyus Jones and Delon Wright I am sure were strongly considered, but Dekker is the type of player that fits into what they are trying to do: spread the floor and get out in transition. Montrezl Harrell in the second round is also a great pick. Harrell is a high motor guy who will be a solid player off the bench for years in the NBA. Now Houston has to focus its attention toward finding a point guard. Keeping Patrick Beverly at a reasonably price has to be a top priority for this team this summer. So I have nothing against the Frank Kaminsky pick. I think he fits nicely next to Al Jefferson in the front court and will be a good NBA player. What I don’t like is if the Hornets did in fact turned down six picks from the Celtics, including four potential first rounders to draft him. That’s crazy the Hornets did not take that trade. They could have gotten a Sam Dekker or Bobby Portis at no. 16 and they would have had other picks in future drafts as well. If you want to stay at No. 9 and pick that works too, but then at least take the player that has the better trade value in Justise Winslow. The Hornets stayed put and still took the player they wanted, even though they probably could have gotten him picks later. The other move that I didn’t like as much was the Lance Stephenson trade. I know it was something that had to be done. Lance was simply not producing on that team, but trading Lance is never a good idea in my book. I still think he is bound to have a bounce back season and now that will be as a member of the Los Angeles Clippers. The Hornets got all they could for a player who just lost all of his value. It turns out all they got was Spencer Hawes, who plays the same way Kaminsky does! The Hawks are in a similar spot as the Blazers, where the team could look drastically different from what it did this past season. I thought they Hawks could have used a player on a rookie contract, so trading their first round pick did not make much sense to me. 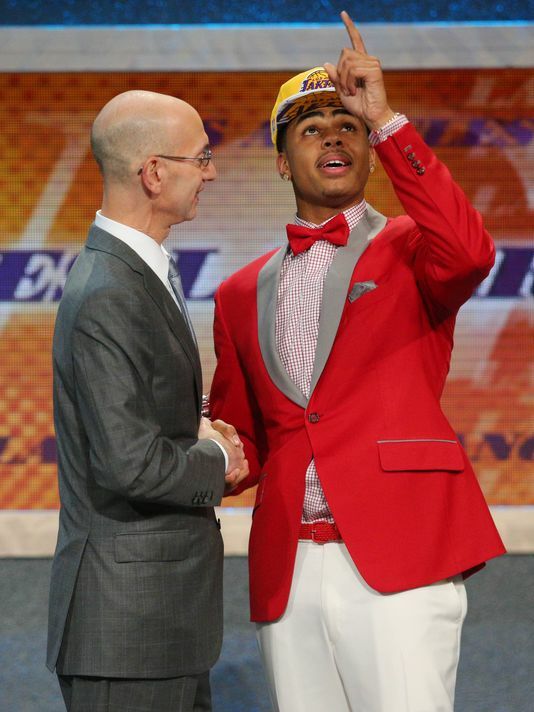 Atlanta ultimately got back Hardaway and two second round picks in return for the no. 15 overall pick. Hardaway had a pretty bad season last year for the Knicks, but is still a young player with potential. I just think there were better players available in this year’s draft than Hardaway. Now the Hawks enter the offseason with a lot of question marks, mainly surrounding free agents Paul Millsap and DaMarre Carroll. Let me start by saying the Sacramento Kings are a mess. I really did not think they would pass on Emmanuel Mudiay if the point guard fell to the no. 6 pick. Mudiay was there, and the Kings still decided to take Willie Cauley-Stein. This is the part I didn’t like. Using the sixth overall pick on a player that is very one sided right now when a top talent that fills a huge need is still available. I do believe Mudiay will be a top 10-15 point guard in this league when those are so hard to come by. Only time will tell which player the Kings should have selected. The reason I get it and do like the Kings taking WCS is because it keeps their superstar happy. Boogie Cousins is friends with WCS and that is definitely the player Cousins would have wanted. That does not make the pick right, but after all of the rumors surround Cousins, coach George Karl and management it’s only right they do one thing to attempt to keep their only real building block happy. The Kings are still a couple years away at the earliest from competing in the Western Conference. This pick does not drastically diminish or improve those plans, but keeping Boogie happy might have been the silver lining in all of this. I’ll leave you with something I came across on Twitter today. Bomani Jones tweeted a video of Jahlil Okafor being introduced as a member of the Philadelphia 76ers. I would imagine this is how many players have felt about joining the Sixers recently, but good for Okafor not trying to hide his true feelings. This entry was posted in Draft / Offseason, Home, NBA and tagged 2015 NBA Draft, 2015 NBA Offseason, Atlanta Hawks, Boogie Cousins, Charlotte Hornets, Houston Rockets, Jahlil Okafor, NBA Draft Grades, Portland Trail Blazers, Sacramento Kings, SB Nation. Bookmark the permalink.